We’d love your help. Let us know what’s wrong with this preview of Cursed Lands by Emma Hamm. To ask other readers questions about Cursed Lands, please sign up. I had the opportunity to read an early edition of Orion's Kiss by Claire Luana. This novel was phenomenal. I cannot wait to read the other stories in this set. This specific story focuses on Mer and her curse. She is reincarnated time and time again, and her sisters...always murdered. This is a standalone novel from Claire and this novel is intense but with so much sarcasm and wit. Mer is a one of the main characters, and she is incredibly strong and stubborn. Ryan is another of the main protago I had the opportunity to read an early edition of Orion's Kiss by Claire Luana. This novel was phenomenal. I cannot wait to read the other stories in this set. Mer is a one of the main characters, and she is incredibly strong and stubborn. Ryan is another of the main protagonists, and he can be caring, charming and sweet. The trials that these two have both faced in their past lives is tremendous and seems insurmountable throughout the entire novel. Seeing how they work together and separately to try and stop the curse is uplifting and scary. So many pulse pounding moments, lies at every turn and just such a ride to be on. And, you can get all the books for just 99c at the moment, it's a total bargain! Some of my favorite fantasy and dystopian authors are featured in this set! 22 books for a buck is a killer deal for so much great content! I can't wait to read about the different cursed lands these authors have come up with! This collection of urban fantasy, paranormal romance and dystopian novels from various indie authors has been something I’ve been looking forward to since it was announced in late 2018, and at only a buck, it's a very great value. I’ve been looking forward to contributions by Claire Luana and Nina Walker the most, as I’ve read and loved their previous works. My rating is for the amazing Emma Hamm's lovely book, Cirque de la Lune. I was fortunate enough to read the arc of this magical and utterly heartwarming beauty. Let me tell you I couldn't put it down and finished it in just 3 hours. The setting of this gorgeousness was absolutely enchanting. The World War is over and the world is trying to pick up its broken pieces. People survived the war and life supposedly is coming to its regular course. In the midst of the gray reality, Cirqu My rating is for the amazing Emma Hamm's lovely book, Cirque de la Lune. The setting of this gorgeousness was absolutely enchanting. The World War is over and the world is trying to pick up its broken pieces. People survived the war and life supposedly is coming to its regular course. In the midst of the gray reality, Cirque de la Lune provides the reprieve from the dullness of the life. It is magical, it is whimsical, full of wonders. Every member of Cirque de la Lune has a story to tell. This brings us to the wonderful set of the characters Emma created. You WILL fall in love with everyone. OH LORD I am so protective of each and every one of the member of Cirque de la Lune. And I am not the only one feeling that way about them. Frank Fairwell was saved by them and brought into the magical world of de la Lune. He was such a great character with all the right amount of swoon worthy moments. He was dumbstruck by the beauty of one of my favorite members of Cirque de la Lune, Evelyn. She is magic herself. Her beautiful soul is even more enchanting to Frank than her beguiling looks. Her story is a heartbreaking one and I felt so fiercely for her. I loved how they had such an understanding and wonderful chemistry between each other. Romance was done lovely. Emma is a master at feels and all-consuming emotions. The noteworthy side characters were the whole cast of "the freaks". I hate this term but it is hard not to mention it as it is quite common when describing unique members of circus. Clara, Booker, Tom and Daniel. You have to read the book to find out about their unique abilities. They all were so precious. Now one of the most beautiful things about this book was Frank's love and acceptance of the differentness of this unique group. Coming from a wealthy family, he was supposed to be a spoiled and entitled high-born, but his deep understanding and willingness to embrace this group was a heartwarming element to my whole experience. I truly enjoyed it and I am so so curious to see what Emma is going to do with the story from there on. Booker was one of the members of the group was the most mysterious one and I was dying to get into his head and find out all the secrets he was harboring. I’m so excited about this collection! Some of my fav authors in the YA Fantasy genre all in one place! People would be crazy not to grab this for a freaking dollar! Really excited about this set. So cheap, so many books! Excellent authors, great stories, and something for everyone who loves PNR, dystopian, or UF. There is so much packed into this one boxed set! Magic, fairies, and so much more. Seriously, you have to check it out. So many great books in this set! The wait is killing me. I so anxious to finally get my hands on this and indulge in all the awesome stories. It's like 100 hours of reading! I'm stoked! Such an amazing collection of authors and the Salem 2317 book was amazing! A beaten man. A woman made of fire. A circus full of magic. Cirque de la Lune is an exquisite novella. The story of love and triumph, trials and hardships of these characters was a delight to read. There are small surprises packed into such a small space, and my only complaint is that I needed more!! I fervently recommend this to any lover of magic and romance. This set is packed full of spellbinding stories, written by talented authors. It's definitely one you don't want to miss, and you can't beat the price! I am so excited for this book to come out!!! 22 books for a buck! And I love the mix of fantasy genres. An incredible collaboration! The Shadow Games by Alison Ingleby Spoiler Free Review. This story is a part of the Cursed Lands fantasy collection. I went in a little blind on this one. I didn't really know what to expect. All i knew was that the first line of the blurb hooked me! And I'm so glad I dove into it blind, because, I absolutely LOVED it! This had me addicted! I gave this a 4.5 outof five stars. The writing was fantastic. The world and story wa The Shadow Games by Alison Ingleby Spoiler Free Review. I just finished BEHIND GLASS by the oh so talented Elle Scott. This is but one of the novels in this exciting boxset. So far I've loved everything I've read by this author. Imagine having no memory prior to age 12. Then every night at the same time without fail your parents drill you regarding said missing memories. What's the point of all this when Eden can't recall anything! Ok do that's not quite true. She remembers the eyes of a boy behind glass filled with pain. Somehow she just knows he's I just finished BEHIND GLASS by the oh so talented Elle Scott. This is but one of the novels in this exciting boxset. So far I've loved everything I've read by this author. Imagine having no memory prior to age 12. Then every night at the same time without fail your parents drill you regarding said missing memories. What's the point of all this when Eden can't recall anything! Ok do that's not quite true. She remembers the eyes of a boy behind glass filled with pain. Somehow she just knows he's important, but who is he! And WHY the same baseless questions every single evening? Trapped in the house as drones now patrol the skies. If only she could recall a time before this. Everything changes in an instant. Asked the same nightly questions she tells her parents of the boy and compare his eye colour to Lake Louise. Ruh roh! Her parents froze. Their eyes huge. Suddenly they looked at her saying she'd never even been to that Lake! Hey somewhere deep within she knows that's untrue. The rest of her life would indeed change that night. Good vs evil, hunters, archangels, nephilim, watchers and more. Eden entire world just opened up to an unending universe.....now....who to trust, and where are her memories! A fight was coming and all she had were her instincts. This book is highly addictive and great fun! I for one hope it's a series in the making. Even before her returned memories Eden is fierce, big hearted, a warrior for good.....take her ride and see just how special she is!! I have read a few of the books in this set so far and I'm loving it!! Crimson Mage by Dorothy Dreyer, Dead Silence by K.G. Reuss, Shades of Human by J.L. Myers, and Behind Glass by Elle Scott are four of the epic stories included in this boxed set. Dead Silence is about a girl who can't tell the difference between reality or what's in her mind. A supernatural/psychological thriller. She's losing it, and she's not sure she can trust the world around her. There are things in the shadows trying to I have read a few of the books in this set so far and I'm loving it!! Crimson Mage by Dorothy Dreyer, Dead Silence by K.G. Reuss, Shades of Human by J.L. Myers, and Behind Glass by Elle Scott are four of the epic stories included in this boxed set. Dead Silence is about a girl who can't tell the difference between reality or what's in her mind. A supernatural/psychological thriller. She's losing it, and she's not sure she can trust the world around her. There are things in the shadows trying to get her, voices in her head. She hears them, she sees them, she can't sleep. Is death preferable? Can anyone save her? What about the Shadow man? Does he want to help her? I went into this book not really sure what to expect. From the cover, you can kind of tell it was gonna be somewhat of a suspense/thriller. But I definitely didn't expect what jumped off the pages. It's an edge-of-the-seat, nail-biting, gripping, thrilling, blood chilling story that keeps you guessing. You're gonna love it. I did. This is an amazing series. Crimson Mage is set in a world where Magic is illegal. Mages are imprisoned or put to death. But sometimes they are given a choice: Work for the new government or face imprisonment. That's not really a choice at all. Magic users are given an implant that stops them from being able to use their abilities. Mages are training to protect the reincarnation of the Lotus Empress, but how can they do that when everything has been shut down, silenced, destroyed, and made illegal? This book is epic and luckily, it won't be the only one to come. Shades of Human by J.L. Myers is another great story. I've read everything she's written and I'm still blown away by the amazing worlds she creates. I cannot wait to read the 2nd book in this series. Calli (which is so close to my name it makes me grin) lost her mom at a young age (and btw, pack tissues when you read this because the first chapter makes you bawl like a baby!!) and she's shuffled in and out of foster homes since the age of four. Her mom's dying wish is simple: don't look in the mirror, don't talk back to the voices, and don't ask for help or sing. Calli doesn't understand why, but she honors the wish anyway. I'm super excited for this boxed set to come out so everyone can read these amazing stories!! You're for sure going to find some new favorites. I can't wait to read more!! I've read a lot of books about Angels, but so far Behind Glass by Elle Scott is one of the most unique. It has a new take on nephilim. The character development is really cool, but I can't tell you why lol it would spoil the story :-D I'm not finished yet, but I can already tell you that this book is a 5 star, 2 thumbs up, totally worth reading kind of book. I'm already looking forward to reading more in this world. Cirque De La Lune is an intriguing tale about a group of outcasts in a traveling circus. I found the world it was set in very interesting as well as the characters but there were a few inconsistencies and repetition that kept drawing me out of the story. Other than that I thought it was a solid start to a new series that I'm interested in seeing where the author takes it. I had the pleasure of reading Lone Survivor from this amazing box set. This is an excellent story about Sadie and her friends trying to survive in a strange environment where they have been raised. This is an edge of your seat story that won't let you go until the end, and then you are left with more questions and wondering how much longer until the next one comes out. This has great characters and a great story. I loved it. Her story is packed full of suspense, action, a little romance.. Just when you think you have it figured out, it gives a twist & keeps you on your toes. The ending left me with so many unanswered questions, so please hurry with the next addition!! This review is for Emma Hamm's Cirque de la Lune which I received as an ARC. And wow! I fell in love with the characters immediately. The story grabs you from the first page and I literally couldn't put it down. If the rest of the stories in this collection are like this one it will be an amazing read. Loved this story!! First venture into dark gothic circus storyline and I loved it. There was some hint to a worldwide war/catastrophe wich I look forward to reading more about. Frank had such a good heart and the care that he took to respect Evie, not only her but the rest of the circus crew. The story left you wanting more...I especially want to know Bookers storyline! I can't wait to read this entire collection! 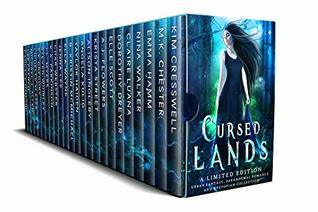 What's better than Fae, Mermaids, Angels, Demons, and so much more in the dark and mysterious Cursed Lands? Have you got your copy yet? It's only 99 cents for 22 novels!!! I read the story by Emma Hamm, Cirque De La Lune. This was a mysterious story about the secrets behind a circus, and they were intersting to find out. I liked the romance, that it bettered both Evelyn and Frank. My favorite part was the family the circus had become, how they all looked out for each other. It began with some action, and ended on a happy note. It's not often you see a group of YA authors coming together to make a set like this. I am BEYOND thrilled! Oh my the Crimson Mage by Dorothy Dreyer in this great collection is fabulous. It has mystery, suspense, drama and times of action that draws you in and has you glued to your seat. It is extremely well written and the characters are beautifully developed. They have great personalities that are so life like. It is a quick read but extremely good. It is one that is definitely worth reading and doesn’t disappoint. As far as I understand it, this is a collection of really short stories. After one novel I expect the collection to be like a degustation menu of various authors. Maybe it is quite obvious, but I was a tiny bit disappointed by the length of the story I read, because I was really enjoying it. Emma's story is about a group of outcasts or rather people who are too different to be accepted by society. The characters are promising, even in such a short story many of them showed considerable depth. This novel is a really nice intro into the planed series which I will definitely look into. However, and I attribute this to the novella format, some events went to quick or were mentioned just briefly. This make the difficult negotiations and relationships development seem much easier and it almost makes this intro a fairy tale. The story by Emma Hamm made think highly of The Greatest Showman! But without the dancing and the swooning. It's a story of love, hidden abilities, beauty, and family. I am seriously wondering if this lovely one will become later a full series! Emma Hamm's story follows a disgraced doctor, who broke up with his fiance and he was beaten to death. Then he is saved by the traveling circus where one woman has a unique and dangerous ability. A wonderful story with great characters and wonderful world build. I can not imagine having as much imaginations as Ella Scott to write such a good book. Behind Glass is just one out of other books in Cursed Lands. I think it would be wise to go get you a copy now as it is limited and you don't want to miss any of these stories. What a wonderful collection of stories to make your day a bit brighter. Each and every story was fantastic. There’s Witches, humans, Vampires and dragons and more. Don’t miss out once it’s released. Warning! Crimson Mage will leave you wanting the next book in that series!! That book alone is worth the box set! I am sure all the other stories are equally amazing and are all pure bonuses! We all know you don't really care about reading my background. Enjoy Cap instead.